Background: Participation of Iranian women with a family history of breast cancer in breast cancer screening programs is low. This study evaluates the compliance of women having a family history of breast cancer with clinical breast exam (CBE) according to the stage of transtheoretical model (TTM) and health belief model (HBM). Materials and Methods: In this cross-sectional study, we used Persian version of champion's HBM scale to collect factors associated with TTM stages applied to screening from women over 20 years and older. The obtained data were analyzed by SPSS, using descriptive statistics, Chi-square test, independent t-test, and analysis of covariance. Results: Final sample size was 162 women. Thirty-three percent were in action/maintenance stage. Older women, family history of breast cancer in first-degree relatives, personal history of breast disease, insurance coverage, and a history of breast self-examination were associated with action/maintenance stage. Furthermore, women in action/maintenance stages had significantly fewer perceived barriers in terms of CBE in comparison to women in other stages (P < 0.05). There was no significant difference in other HBM subscales scores between various stages of CBE screening behavior (P < 0.05). 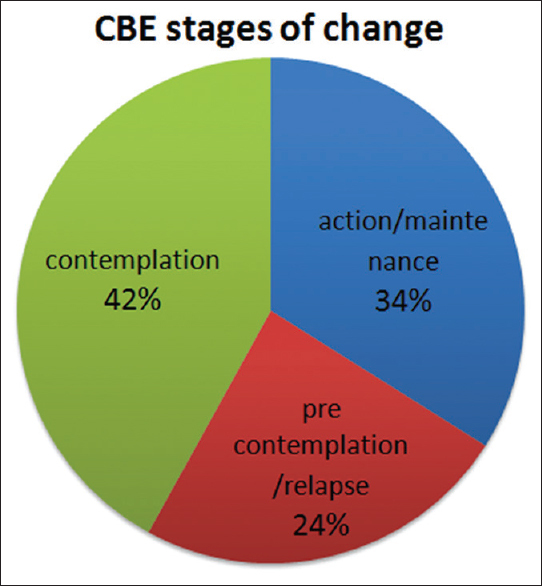 Conclusion: The finding indicates that the rate of women in action/maintenance stage of CBE is low. Moreover, results show a strong association between perceived barriers and having a regular CBE. These clarify the necessity of promoting national target programs for breast cancer screening, which should be considered as the first preference for reducing CBE barriers. Background: The current study was designed to compare the complications and adverse effects of central venous catheter (CVC) insertion under ultrasound guidance in patients with and without coagulopathy. Materials and Methods: In this clinical trial, 59 patients who needed CVC for various reasons were enrolled. 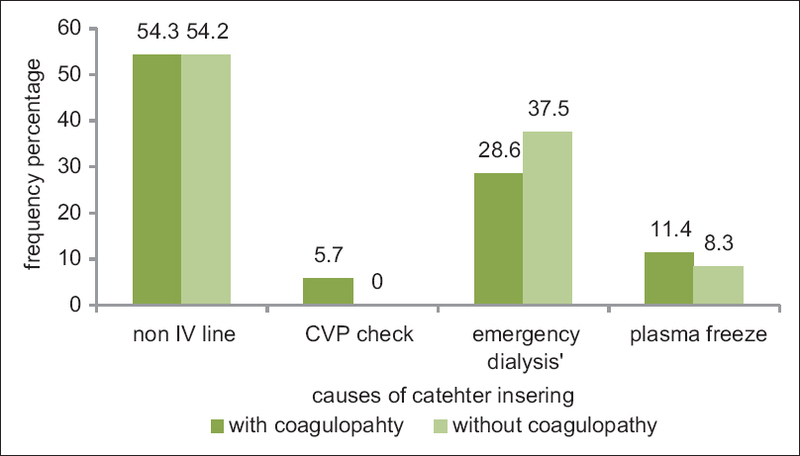 Patients were divided into two groups of those with and without coagulopathy based on complete blood count, prothrombin time, partial thromboplastin time, and international normalized ratio test results, and then, CVC was inserted with ultrasound guidance in both groups. The CVC inserting site was examined for hematoma and hemorrhage in four stages at different times. Results: There was no significant difference in the terms of demographic features, catheter lumen size (P = 0.43), and number of attempting for CVC placement (odds ratio [OR] =2.35, 95% confidence interval [CI] = 0.36–15.3, P = 0.39) between two groups. Seven out of 59 patients suffered from complications (11.9%) that the complications in coagulopathic patients were oozing (5.7%) and superficial hematoma (8.6%) while in noncoagulopathic patients were 4.2% for both complications (OR = 0.54, 95% CI = 0.09–3.07, P = 0.767). Conclusion: According to our results, it can be concluded that inserting CVC with ultrasound guidance under emergency conditions causes no serious and life-threatening complications in coagulopathic patients. Background: This study attempted to determine the effects of long-term use of Vitamin C on vascular endothelial function. Materials and Methods: During a pilot clinical trial study conducted at Imam Hussein Hospital (Isfahan) in 2014–2015, a total of forty diabetic patients were selected and then assigned randomly into two twenty-subject groups receiving Vitamin C and placebo tablets. The patients were treated with Vitamin C or placebo for 6 months. All patients were examined through echocardiography in terms of cardiac function before and after treatment. To evaluate the endothelial function (flow-mediated dilatation [FMD], intima-media thickness), they underwent arterial Doppler. Moreover, the chemical indices of vascular function were tested through intercellular adhesion molecule and vascular cell adhesion molecule (VCAM). Finally, the results were compared between the two groups. Results: Based on the results, the mean left ventricular mass significantly reduced after the intervention in the group treated with Vitamin C (from 76.35 ± 25.6–68.62 ± 22.66; P = 0.015) while there was no significant difference observed in the control group (from 67.58 ± 25.38–71.63 ± 26.84; P = 0.19) but no statistically difference between the two groups-based repeated measures ANOVA test (P = 0.6). 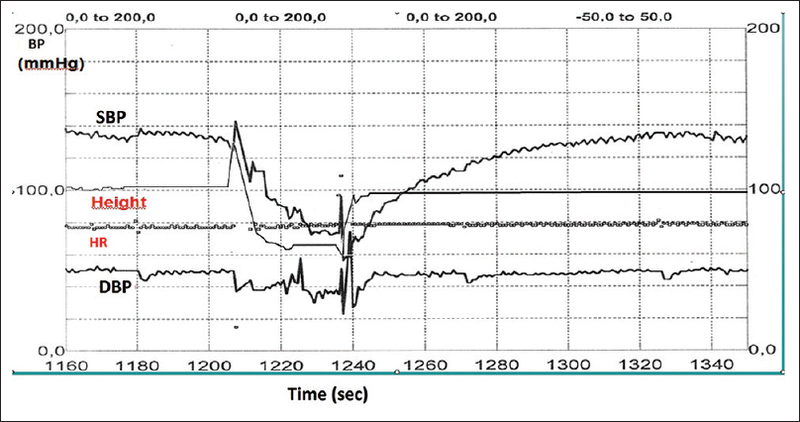 In addition, the mean of VCAM changes was significantly difference between the two groups (P < 0.001). Conclusion: Long-term use of Vitamin C in diabetic patients can improve certain echocardiographic parameters such as ejection fraction, fractional shortening, and FMD, which in turn enhances vascular endothelial function. Background: The aim of the study was to determine the correlation between clinical and echocardiographic findings and risk factors of patients with suspected acute pulmonary thromboembolism (PTE) who underwent computed tomography pulmonary angiography (CTPA). 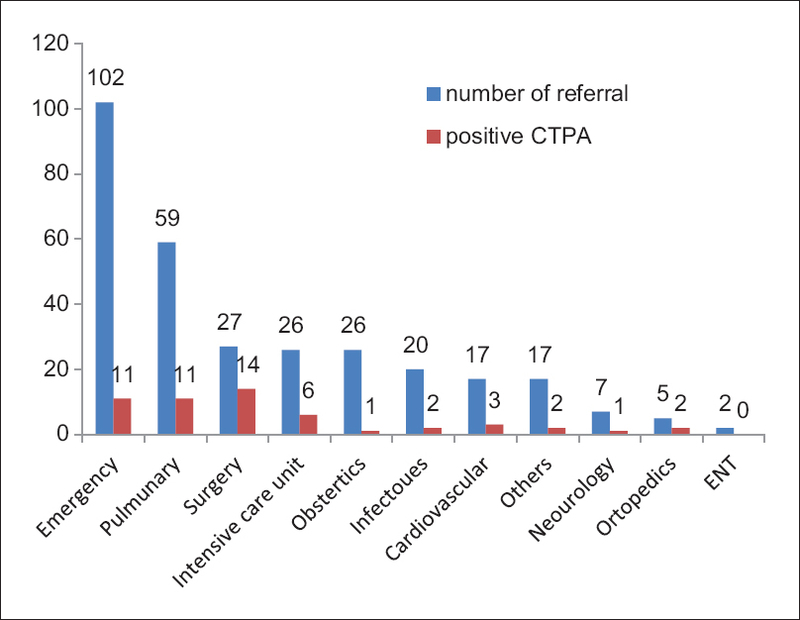 Materials and Methods: In this cross-sectional study, 310 hospitalized patients aged >18 years with high clinical suspicion of PTE referred to imaging center of our hospital from different wards for CTPA were enrolled. The frequency of different clinical presentations, risk factors, items of Wells' criteria, and echocardiographic findings was compared in patients with and without PTE, which have been diagnosed according to the CTPA results. Results: PTE was diagnosed in 53 (17.1%) of patients with suspected PTE. From clinical manifestations, tachypnea, pleuritic chest pain, and edema of lower extremities were significantly more frequent among patients with PTE (P < 0.05). Major surgery was the risk factor which was significantly more prevalent among patients with PTE (P < 0.05). Frequency of all criteria of Wells' criteria, except hemoptysis, was significantly higher in patients with PTE (P < 0.05). The frequency of all studied echocardiographic variables was significantly higher in patients with PTE (P < 0.05). Conclusion: It is suggested that we could use the results of this study for utilizing the diagnostic process of PTE in patients with highly clinical suspicion of PTE and providing more validated decision. Using the results of this study, we could identify high-risk patients and made appropriate risk assessment for better management of patients with suspected PTE as well as reduce the rate of unnecessary CTPA and its related adverse consequences. Background: Most of the cardiovascular diseases can be prevented by doing regular physical exercises and using herbal supplements. The present study is aimed at assessing ginger supplement and high-intensity interval training (HIIT) on inflammatory indices contributing to atherosclerosis in overweight women. Materials and Methods: The present study is a randomized, experimental, and controlled one in which thirty healthy overweight women aged 20–30 years were randomly divided into three equal groups, namely, ginger, ginger + HIIT, and placebo + HIIT. The training groups performed high-intensity interval exercises (i.e. 40-m maximal shuttle run) for ten consecutive weeks. The supplement groups daily took 3 g of ginger pills and the third group took placebo. Results: Paired t-test revealed a significant decrease in the density of type 1 monocytes chemo tactic protein (MCP-1) in HIIT + ginger (P = 0.026) and HIIT + placebo (P = 0.001) groups. Besides, maximum aerobic capacity in the two training groups significantly increased P = 0.002 and P = 0.000, respectively. In spite of this, analysis of variance showed no significant differences in three groups regarding the three indices such as intercellular adhesion molecule-1 (ICAM-1) (P = 0.093), MCP-1(P = 0.075), and serum interleukin-10 (IL-10) (P = 0.164). Conclusion: A 10-week intensive interval exercise, by itself or together with ginger supplement, improved MCP-1 and maximum oxygen consumption in overweight women, without any significant effect on soluble ICAM-1 and IL-10. 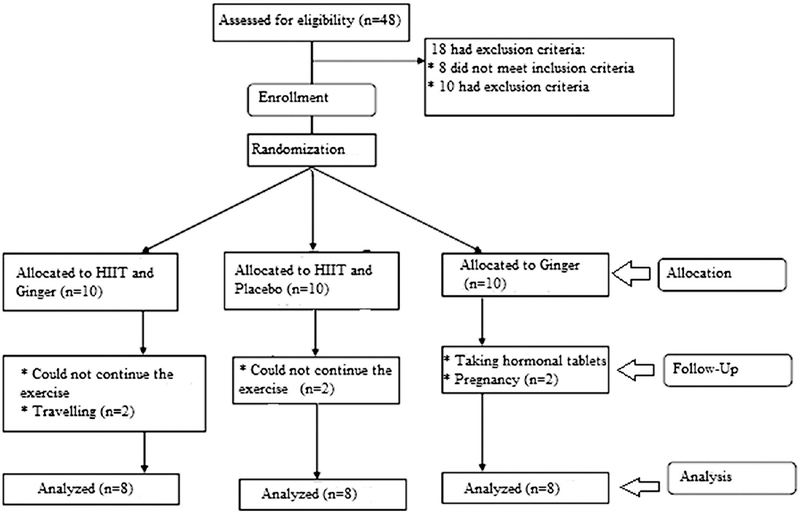 These findings indicate the relative and efficient role of HIIT in overweight women without the necessity to combine with ginger as an antioxidant/anti-inflammatory supplement. Background: The aim of this study was to prevent of increasing end-tidal carbon dioxide (ETCO2)with changing of vital capacity and respiratory rate when using of birthing filter in infants. 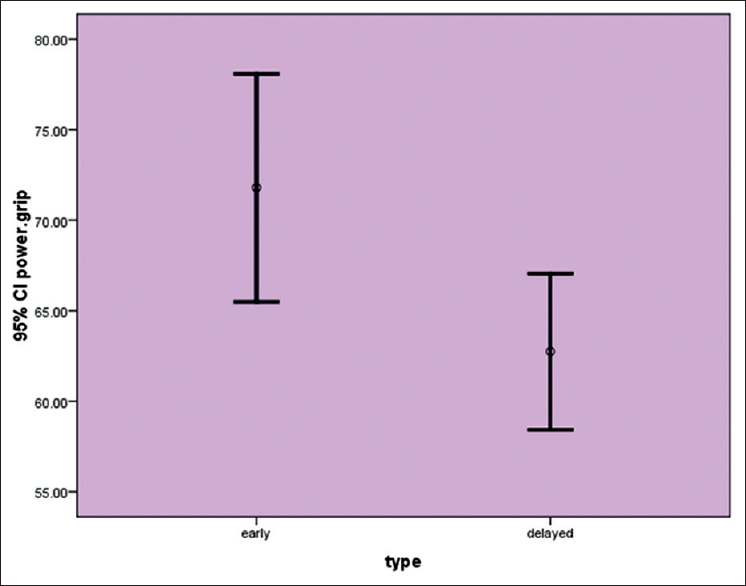 Materials and Methods: In a randomized clinical trial study, ninety-four infant' patients were studied in three groups. Basic values, such as peak inspiratory pressure, tidal volume, minute ventilation, respiratory rate, and partial pressure of ET CO2 (PETCO2) level had been evaluated after intubation, 10 min after intubation and 10 min after filter insertion. In the first group, patients only observed for changing in ETCO2level. 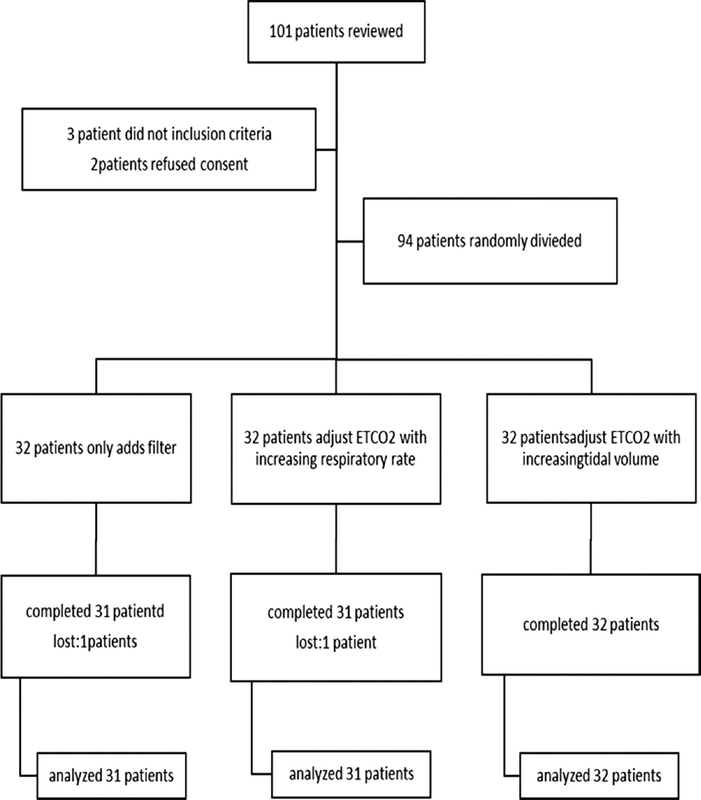 In the second and the third groups, respiratory rates and tidal volume had been increased retrospectively, until that ETCO2 ≤35 mmHg was received. We used ANOVA, Chi-square, and descriptive tests for data analysis. P< 0.05 was considered statistically significant. Results: Tidal volume 10 min after filter insertion was statistically higher in Group 3 (145.0 ± 26.3 ml) versus 129.3 ± 38.9 ml in Group 1 and 118.7 ± 20.8 ml in Group 2 (P = 0.02). Furthermore, respiratory rate at this time was statistically higher in Group 2 (25.82 ± 0.43) versus Groups 1 and 3 (21.05 ± 0.20 ml and 21.02 ± 0.60 ml, respectively) (P = 0.001). Minute volume and PETCO2level were statistically significant between Group 1 and the other two groups after filter insertion (P = 0.01 and P = 0.00,1 respectively). Conclusion: With changing the vital capacity and respiratory rate we can control PETCO2level ≤35 mmHg during using of birthing filters in infants. We recommend this instrument during anesthesia of infants. Background: Pre-eclampsia as a hypertensive disorder of pregnancy complicates up to 5–10% of pregnancies worldwide. Endothelial dysfunction plays an important role in the pathogenesis of pre-eclampsia. In this study, we aim to evaluate the effect of high-dose folic acid on endothelial dysfunction in pre-eclamptic patients. 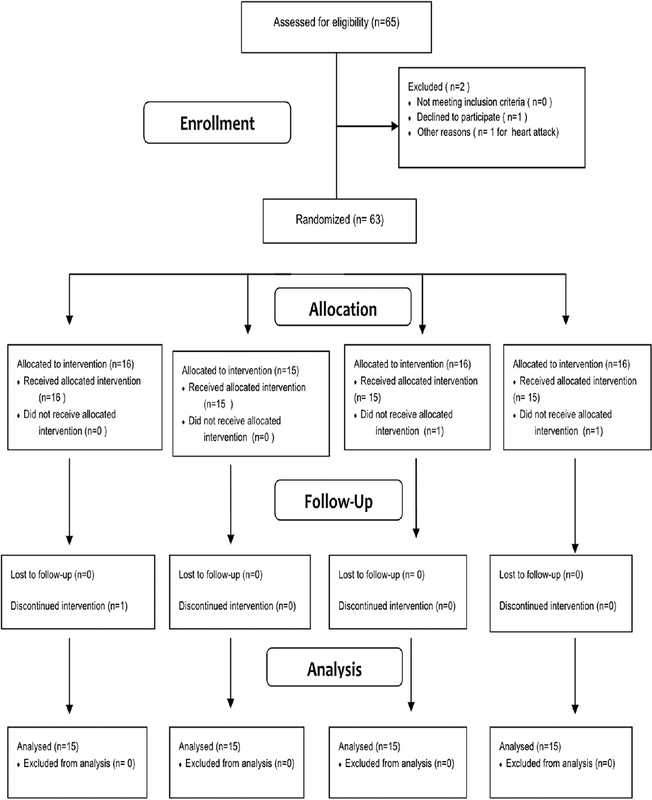 Materials and Methods: In this triple-blinded randomized clinical trial, the enrolled patients were divided randomly into two groups. Folic acid 5.0 mg or placebo was taken daily by oral administration from the initiation of diagnosis until 2 months after delivery by the participants. Every patient's flow-mediated dilation (FMD) was evaluated at the beginning of the study and 2 months after delivery with the same experienced operator at the same period of time (3–5 p.m.) by high-resolution B-mode ultrasonography. Potential confounding variables were included in the independent samples t-test. 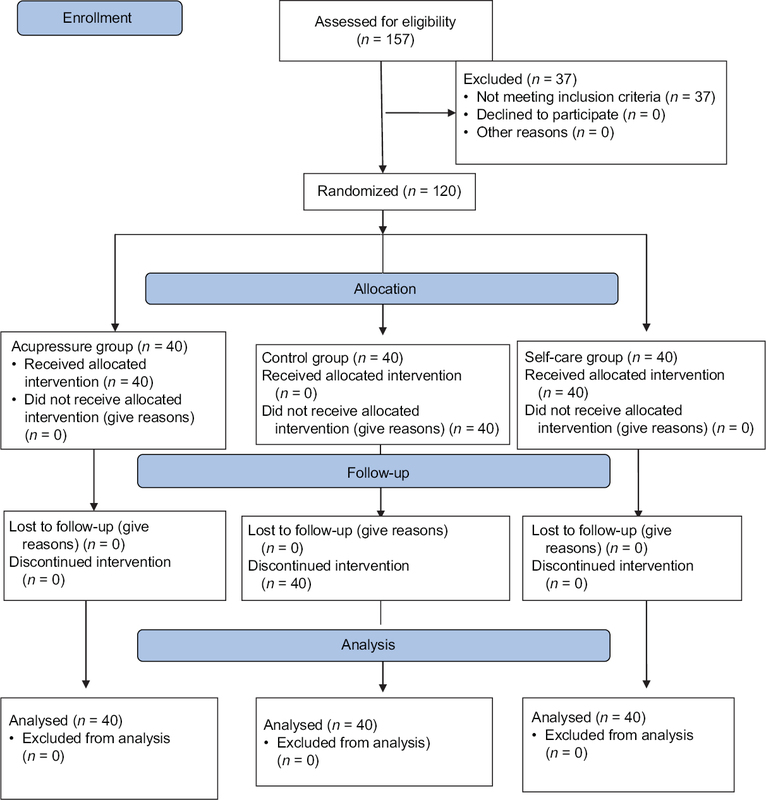 t-test or Mann–Whitney U-test was used in the comparison of means between the intervention and placebo groups. To compare FMD in each group, before and after the intervention, paired t-test was used. Results: Mean value of FMD in intervention (9.64 ± 5.57) and control group (9.30 ± 4.25) has no significant difference before the consumption of drugs (P < 0.05). FMD in intervention group (13.72 ± 7.89) significantly increases after daily consumption of 5 mg folic acid in comparison with control group (10.02 ± 4.81) after daily consumption of placebo (P = 0.002). Conclusion: Increased mean of FMD in intervention group shows that this supplement can improve endothelial function and can be significantly affected by maternal blood pressure during pregnancy and some endothelium-dependent disease such as pre-eclampsia and its associated adverse outcomes. Background: Cardiopulmonary bypass is associated with increased fluid accumulation around the heart which influences pulmonary and cardiac diastolic function. The aim of this study was to compare the effects of modified ultrafiltration (MUF) versus conventional ultrafiltration (CUF) on duration of mechanical ventilation and hemodynamic status in children undergoing congenital heart surgery. Materials and Methods: A randomized clinical trial was conducted on 46 pediatric patients undergoing cardiopulmonary bypass throughout their congenital heart surgery. Arteriovenous MUF plus CUF was performed in 23 patients (intervention group) and sole CUF was performed for other 23 patients (control group). 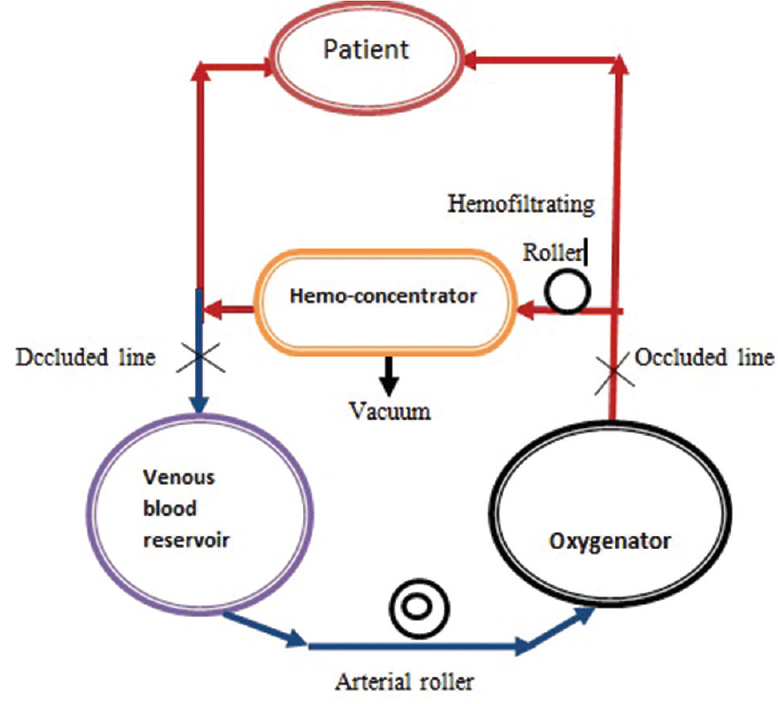 In MUF group, arterial cannula was linked to the filter inlet through the arterial line, and for 10 min, 10 ml/kg/min of blood was filtered and returned via cardioplegia line to the right atrium. Different parameters including hemodynamic variables, length of mechanical ventilation, Intensive Care Unit (ICU) stay, and inotrope requirement were compared between the two groups. Results: At immediate post-MUF phase, there was a statistically significant increase in the mean arterial pressure, systolic blood pressure, and diastolic blood pressure (P < 0.05) only in the study group. Furthermore, there was a significant difference in time of mechanical ventilation (P = 0.004) and ICU stay (P = 0.007) between the two groups. Inotropes including milrinone (P = 0.04), epinephrine (P = 0.001), and dobutamine (P = 0.002) were used significantly less frequently for patients in the intervention than the control group. Conclusion: Administration of MUF following surgery improves hemodynamic status of patients and also significantly decreases the duration of mechanical ventilation and inotrope requirement within 48 h after surgery. Background: Osteoporosis affects quality of life (QoL) and may lead to depression in women. The purpose of this study was to evaluate the effects of zoledronic acid (ZA) treatment on depression and QoL in women with postmenopausal osteoporosis (PO). Materials and Methods: A total of 88 newly diagnosed women with PO were included in this study. All patients were treated with once-yearly ZA (5 mg). A QoL questionnaire from the European Foundation for Osteoporosis and Beck Depression Inventory were given to patients at baseline and at 12 months. The results for baseline and post - 12th month were compared, and bone mineral density (BMD) levels were compared. Results: The consumption of once-yearly ZA (5 mg) treatment increases BMD at levels of lumbers 1–4 (P = 0.026), total Hip T score's P value is same as femoral neck (P: 0,033). ZA 5 mg treatment also improved QoL (P = 0.001) and reduced depression (P = 0.001). Conclusion: ZA treatment increases BMD levels and QoL while reducing depression. Once-yearly ZA (5 mg) may be considered for postmenopausal women as a first-line treatment. Background: This study was designed to investigate the effect of clopidogrel-related gene polymorphisms on platelet reactivity and clinical outcome in Chinese Han patients. Materials and Methods: Three hundred and thirty-six percutaneous coronary intervention - treated patients were recruited and followed for 1 year. Blood samples were collected from all patients for DNA genotyping. The platelet reactivity unit was measured by the VerifyNow technique. The CYP2C19*2, CYP2C19*3, CYP2C19*17, ATP-binding cassette subfamily B member 1, ITGB3, CYP2C9*3, CYP2B6*9, and P2Y12 alleles were assessed. Results: The clinical endpoints were related to previous heart disease history (11.90% vs. 28.57%, P = 0.017), stroke (12.24% vs. 16.67%, P = 0.039), and diabetes (27.55% vs. 52.38%, P = 0.047). High on-treatment platelet reactivity (HTPR) was frequent in advanced age (P = 0.019), male gender (P = 0.016), hypertension (P = 0.033), and chronic renal failure (P = 0.040). There were more endpoints in the CYP2C19*2 and P2Y12 mutant carriers (76.19% vs. 43.20%, P< 0.001; 50.00% vs. 35.71%, P = 0.001, respectively), whereas fewer in the CYP2C19*17 mutant carriers (11.90% vs. 56.46%, P = 0.001). CYP2C19*2 and P2Y12 polymorphism manifested HTPR (194.25 ± 45.91 vs. 151.38 ± 58.14, P< 0.001; 180.33 ± 67.25 vs. 161.89 ± 56.49, P = 0.008, respectively), whereas CYP2C19*17 mutant improved platelet reactivity (97.17 ± 45.38 vs. 169.08 ± 57.15, P = 0.003). However, there were no further cardiovascular deaths in endpoint patients. 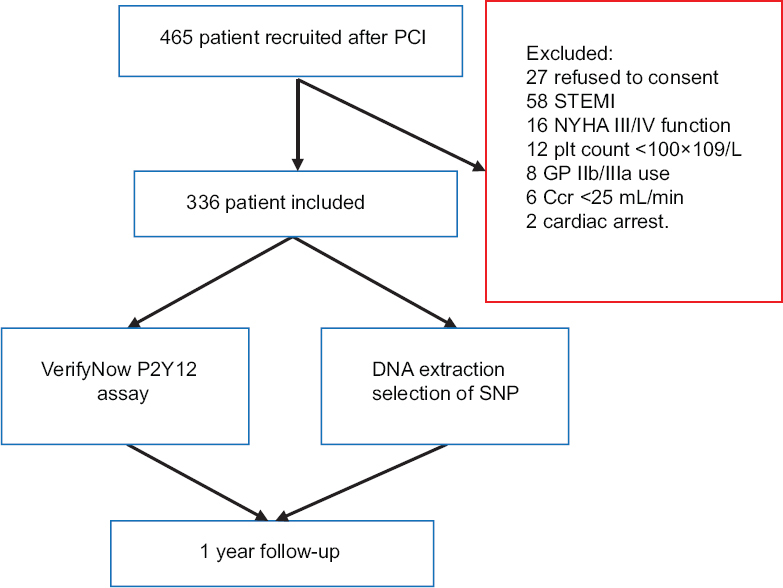 Conclusion: In Han Chinese people of mainland China, clopidogrel-related gene polymorphisms are related to variable platelet reactivity after clopidogrel maintenance dosing, which influences major adverse cardiovascular events, without an effect on cardiac death. Background: The objective of this study was an investigation of the association between depression and sleep quality. Materials and Methods: This cross-sectional study was performed on 360 delivered women that referred to thirty health-care centers in Ardabil, Iran. The Standard Pittsburgh Sleep Quality Index questionnaire was used to the investigation of sleep quality. We used the Edinburgh Postnatal Depression Questionnaire to assess postpartum depression. Logistic regression was used to examine the association of sleep quality with postpartum depression. Results: Chance of depression in women with poor sleep quality was 3.34 times higher than those with good sleep quality (odds ratio = 3.34; 95% confidence interval: 2.04–5.48; P< 0.001). After controlling for some risk factors, an association observed between sleep quality and depression in postpartum women. Conclusion: we found an association between sleep quality in women who had given birth in the last 3 months and symptoms of postpartum depression. Background: Despite a general consensus regarding the impacts of early excision and grafting (EE and G) of burned hand on the reducing of treatment cost and hospital stay, there are some controversial issues about its effect on the outcome of hand function. This study conducted to compare the results of the EE and G and delayed skin grafting in deep hand burns regarding the hand functional outcome. Materials and Methods: This study was conducted from April 2012 to November 2013 in sixty patients with deep thermal burns of the dorsal hand with total body surface area (TBSA) <20% who were admitted to special burn hospital. After standard primary burn care and resuscitation, necessary procedures (EE and G or more conservative treatment) were performed based on the patients' conditions. The patients were placed into early excision (No. =30) and delayed excision group (No. =30). Total active motion (TAM) of fingers, grip strength of the hand and the assessment of disabilities of the arm, shoulder and hand questionnaire, were measured in all patients 6 months after grafting. Results: The average percentage of TBSA in the EE and G group was more than the delayed excision group (17.34% ±5.12% vs. 15.64% ±5.83%), this difference was not significant (P = 0.23). After 6 months, the average of the TAM and grip strength in the EE and G group was significantly more than that of the delayed group (P < 0.0001 and P = 0.019). Conclusion: The present study showed that EE and G with proper physical therapy and rehabilitation management provides a higher functional outcome in dorsal deep burned hand. Background: This study aims to investigate the concentrations of lead, cadmium, and arsenic in the human milk, and to assess the effect of jujube fruit consumption by lactating mothers in reducing the concentration of these heavy metals in their milk. Materials and Methods: This randomized controlled trial was conducted in 2014 among forty postpartum mothers in Isfahan, the second largest and polluted city in Iran. Mothers were randomized into two groups; the intervention group received 15 g/day of fresh jujube fruit, and the controls received routine care for 8 weeks. Results: In the beginning, the concentrations of lead, cadmium, and arsenic were high, without significant difference between groups. The mean (standard deviation) concentrations of lead, cadmium, and arsenic were 29.49 (16.6), 4.65 (3.51), and 1.23 (0.63) μg/L, respectively. The smoothed empirical distribution of environmental pollutants showed that in both groups the mean values and variance of toxic metals decreased after 8 weeks, with a sharper decline in the intervention group. Quantile regression analysis showed that in the intervention group, lead concentration decreased by 2.54 μg/L at the 90th quintile, and cadmium decreased by 0.19 μg/Lat 75th quintile; without significant change in arsenic level. The corresponding figures were not significant in the control group. Conclusion: The concentrations of heavy metals were high in human milk, and the consumption of jujube fruit had some beneficial effects in reducing these harmful elements. Pregnant and lactating mothers should be advised to reduce their exposure to environmental pollutants, and consumption of some natural medicinal foods can be useful in reducing the concentration of pollutants in human milk. Because of numerous benefits of breast milk, in spite of the existence of some toxic trace elements, breastfeeding must be encouraged because such contaminants are also found in water and formula. The impact of the current findings on the primary prevention of chronic disease should be determined in future longitudinal studies. Background: Patients with functional gastrointestinal disorders (FGIDs) may use specific coping strategies. We intend to provide a mediating role of the relationship between pain (intensity and acceptance), cognitive emotion regulation strategies, and negative emotions in patients with FGIDs. Materials and Methods: Participants were 176 inpatients, all experiencing significant FGIDs symptomatology as confirmed by gastroenterologists. Patients completed data on cognitive emotion regulation questionnaire, short form of depression, anxiety, stress scale, chronic pain acceptance questionnaire-revised, and pain intensity scale. Data were analyzed using structural equation modeling method. Results: The pain intensity had significantly direct effect on cognitive emotion regulation strategies and indirect effect on negative emotions. Besides, the mediating role of negative emotions in the relationship between the strategies and pain acceptance were supported, whereas indirect relationships between pain intensity and acceptance through cognitive strategies were not confirmed. Conclusion: The results of the study emphasize the role of pain intensity in the development of negative emotions through cognitive strategies and the role of the strategies in pain acceptance through negative emotions. In fact, cognitive strategies to be related to pain and emotions. Background: Nonalcoholic fatty liver disease (NAFLD) is the most common chronic liver disease in the world. Oral administration of symbiotic and Vitamin E has been proposed as an effective treatment in NAFLD patients. This study was carried out to assess the effects of symbiotic and/or Vitamin E supplementation on liver enzymes, leptin, lipid profile, and some parameters of insulin resistance (IR) in NAFLD patients. Materials and Methods: We randomly assigned sixty NAFLD adult patients to receive (1) symbiotic twice daily + Vitamin E-like placebo capsule; (2) 400 IU/d Vitamin E + symbiotic-like placebo; (3) symbiotic twice daily + 400 IU/d Vitamin E; and (4) symbiotic-like placebo + Vitamin E-like placebo for 8 weeks. Results: Symbiotic plus Vitamin E supplementation led to a significant decrease in concentrations of liver transaminase (P ≤ 0.05). Mean difference of apolipoprotein A-1 was more significant in symbiotic group compared to control. However, mean difference of apolipoprotein B100/A-1 was only significant in symbiotic group compared to control. At the end of the study, significant differences in total cholesterol (TC) and low-density lipoprotein cholesterol (LDL-C) were seen between the symbiotic plus Vitamin E and control groups (P < 0.001). Furthermore, intake of symbiotic plus Vitamin E supplements led to a significant decrease in concentrations of triglycerides (TG) after the intervention. Significant differences in leptin, fasting blood sugar (FBS), and insulin levels were seen between the symbiotic plus Vitamin E and control groups at the end of the study (P < 0.001). In contrast, symbiotic and/or Vitamin E supplementation did not affect high-density lipoprotein cholesterol and homeostasis model assessment for IR levels. Conclusion: In our study, symbiotic plus Vitamin E supplementation was the most effective treatment in lowering liver enzymes, leptin, FBS, insulin, TG, TC, and LDL-C among NAFLD patients. Background: Obesity is a global public health problem. Visfatin, as an adipocytokine, is coded by a gene known as nicotinamide phosphoribosyltransferase. So far, results were conflicted regarding correlations of visfatin with obesity and metabolic variables. The present study aimed to explore the association between G-948T polymorphism of visfatin gene with obesity and lipid profile in a nationally representative sample of Iranian population. 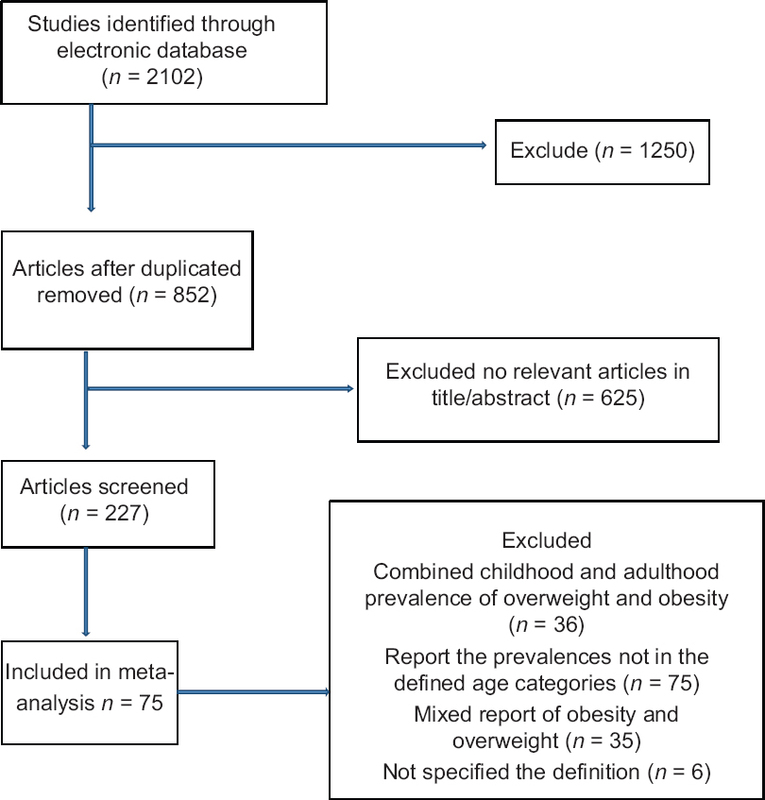 Materials and Methods: In this case–control study, we assessed 129 randomly selected patients with obesity and 182 healthy normal weight controls from participants of Isfahan Healthy Heart Program. Genomic DNA was isolated from peripheral blood cells, and high-resolution melt polymerase chain reaction was performed to explore the presence of G-948T polymorphism. Results: T carriers “GT + TT” were statistically more frequent in the obese patients than the controls (P = 0.013; odds ratio = 1.9, 95% confidence interval = 1.1–3.1). 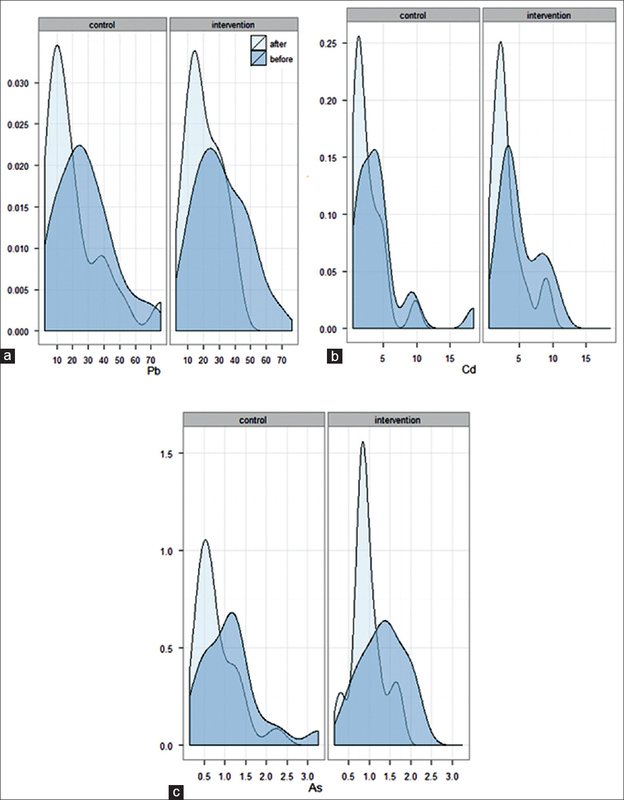 The serum levels of total cholesterol and low-density lipoprotein cholesterol (LDL-C) were significantly different between T carriers and GG homozygote genotype (P = 0.03 and 0.02, respectively). Conclusion: We concluded that visfatin G-948T polymorphism was correlated with obesity, total cholesterol, and LDL-C levels in our population. Background: Dysmenorrhea is one of the common problems during reproductive ages, with prevalence rate of 60–90%. This study aimed to compare the effects of acupressure at Guan yuan (RN-4) and Qu gu (RN-2) acupoints, self-care behaviors training, and ibuprofen on the intensity of primary dysmenorrhea based on McGill pain questionnaire. Materials and Methods: In the randomized clinical trial, 120 females, aged between 18 and 25 years, with primary dysmenorrhea, randomly selected from five dormitories of Shiraz University, Shiraz, Iran were screened and randomized into acupressure group, in that pressure was applied for 20 min over the 1st 2 days of menstruation for two cycles. In the second group, the training group took part in four educational sessions each lasting for 60–90 min and control group received ibuprofen 400 mg. The intensity of pain before and after the intervention was measured using short-form McGill pain questionnaire. The data were entered into the SPSS statistical software (version 16) and analyzed using Kruskal–Wallis test, paired t-test, and Chi-square test. Results: A significant difference was found in the mean intensity of pain before and after the intervention in all the three study groups. The mean score of pain intensity was 10.65 ± 5.71 in the training group, 19 ± 5.41 in the control group, and 14.40 ± 6.87 in the acupressure group after the intervention. The results of Kruskal–Wallis test revealed that both interventions were more effective compared to consumption of ibuprofen. Conclusion: Training and acupressure were more effective than ibuprofen in the reduction of dysmenorrhea. Thus, they can be considered as trainable methods without side effects in adolescent girls. Background: The aim of this study was to validate the Farsi version of Rome III modular questionnaire which contains all functional gastrointestinal disorders (FGIDs). Materials and Methods: We used Rome foundation guidelines for translation of English version into Farsi, and all the steps were performed. In the first step, 2 forward translations into Farsi were completed by two authors separately, and then translators, who participated in Step 1, together with our monitor, compared the two target-language versions and made some changes. The product of Phase 2 was translated back into English by an American-Iranian physician. The final step was comparison of the two English versions and validation of the translation. In this step, we compared the final version item by item, and also we used focus groups of patients after pretesting. Results: Our results showed that FGIDs questionnaire diagnosed 153 patients among 169 patients who were diagnosed to have different types of FGIDs. The sensitivity of this questionnaire was 90.5%. It was determined that the odd questions' values of Cronbach's alpha was 0.77 (very reliable), and it was 0.71 (very reliable) in other sections. The split-half test reliability of whole items value was 0.72, which is statistically significant. Conclusion: Our findings showed that the Farsi version of Rome III diagnostic questionnaire for the adult functional gastrointestinal disorders demonstrated good validity and reliability and could be used in clinical studies. Background: Strontium, zinc, and potassium salts have been demonstrated to inhibit irritation and inflammation when applied topically. Particularly, strontium chloride (SC) and potassium nitrate (KN) are reported to reduce skin and tooth sensitivity. The aim of the present study was to compare the anti-irritant effects of four inorganic salts and assign the ingredient which can suppress skin irritation due to chemical or environmental exposure, more effectively. We compared the anti-inflammatory effects of SC, strontium nitrate (SN), KN, and zinc chloride (ZC). Materials and Methods: This double-blind trial was conducted on 32 healthy volunteers with sensitive skin. Irritation was induced by 24 h exposure with 1.0% sodium lauryl sulfate on arms.. Treatments were applied by an ointment of SN, SC hexahydrate, KN, and ZC and their 1%, 3%, and 5% (w/v) concentrations were prepared. The dosage was twice daily for 6 days to the irritated areas. Skin reactions were evaluated instrumentally. Results: SC had a beneficial effect that was significant overall. All other treatments exert a protective effect in skin barrier function but not significantly. With the exception of ZC, all test substances improved skin hydration but the effect of SC was significant. In respect of colorimetric assessment, all treatments, excluding ZC, reduced erythema significantly compared with an untreated control 7 days after treatment start. There was no support for a dose-response effect. Conclusion: Analysis of the biometric measurements revealed that the strontium salts are best, not treating is worst, and there is little difference between the other treatments. Hence, the skin care products containing SC and SN may reduce the signs and symptoms of irritant contact dermatitis. Background: The nonamnesic type of mild cognitive impairment (na-MCI) is predementia state with subtle decline incognitive domains except memory. Although cognitive rehabilitation (CR) has been investigated in amnesic type of MCI, we could not find any trial that rehabilitated na-MCI exclusively. We studied the effectiveness of CR on na-MCI. Materials and Methods: This study was a blinded, randomized clinical trial. 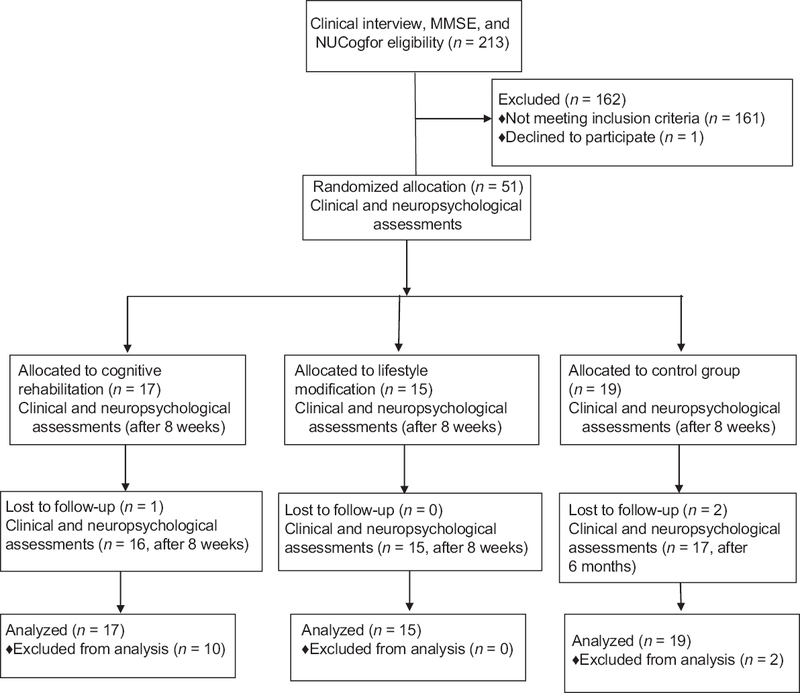 Individuals with age of 60 years or more, complete self-directedness and diagnosis of na-MCI, based on Neuropsychiatry Unit Cognitive assessment tool, were selected. The 51 patients were randomly assigned into three groups: CR, lifestyle (LS) modification, and the control group (CG). Neuropsychological tests for executive functioning were assessed at the baseline, after the interventions, and 6 months later. Results: The mean score of the “design fluency” test increased significantly in CR, compared to LS and CG (P = 0.007). In “five-point” test, mean score increased significantly in CR (P = 0.03). There was higher mean score of Behavioral Rating Inventory of Executive Function for adults in CR (P = 0.01). Conclusion: Consideration of the MCI subtypes allows us to target specific cognitive domains, such as information processing, for better CR outcome. CR may result in better performance of executive functioning of daily living. Background: This study aimed to evaluate the strength of anti-Mullerian hormone (AMH) and follicle stimulating hormone (FSH) in reflecting the antral follicle count (AFC) in infertile females. Materials and Methods: This cross-sectional study was conducted on 160 females, visiting infertility clinic for assisted reproduction. Serum samples collected on the 3rd day of the cycle were assayed for FSH, luteinizing hormone, and AMH while AFC was assessed via transvaginal ultrasound. The study cohort was segregated into three groups based on AFC. Results: Chronological age and FSH was significantly high in females with very low AFC (P < 0.01 and 0.009, respectively), yet they failed to discriminate patients with normal and higher follicle count (P = 0.65 and 0.84). Conversely, AMH reported highly significant difference between very low AFC and with those having either normal AFC (P = 0.002) or higher AFC (P = 0.001). Moreover, a significant difference in AMH was observed between normal and higher AFC group (P = 0.04). Conclusion: Compared to female's age and FSH, AMH is superior in clustering study cohort on the bases of antral follicular pool, especially in setups with nonavailability of technological expertise to assess AFC. Incorporation of AMH along with other biomarkers improves estimation of baseline ovarian reserve, required to standardize dose for optimum response; avoiding the risk of failure to retrieve oocyte or inappropriate stimulation leading to ovarian hyperstimulation syndrome. Further prospective studies are required to ascertain its role in predicting the outcomes of ART in such patients. Background: It is intriguing and imperative that the comparison of the iron preparations in hemodialysis (HD) patients. 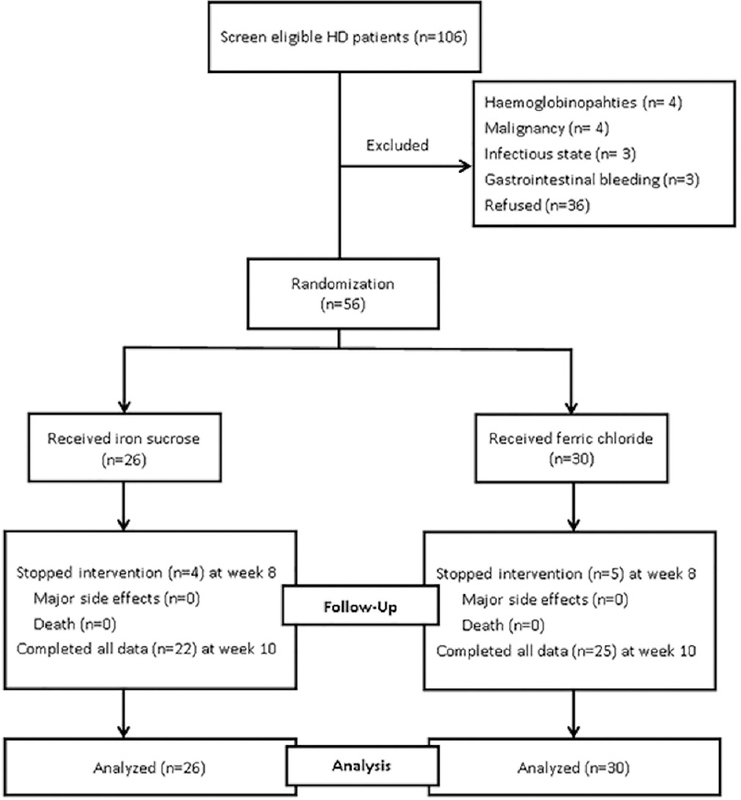 This study aimed to observe the short-term efficacy of parenteral iron sucrose and ferric chloride in HD patients . Materials and Methods: This was a consecutive 10-week single-blind study in Taiwan. An intravenous iron supplement of 100 mg/week was administered as an infusion in 100 ml of normal saline, until a total dose of 1000 mg was achieved. The primary outcome was evaluated by the changes in serum hematocrit (Hct) levels. The changes in serum Hct and iron indices were evaluated every 2 weeks for 10 weeks. The results were collected from 21 April to 4 July 2013. Results: A total of 56 HD patients completed the study. Subjects were randomized into an iron sucrose group (26 patients) and a ferric chloride group (30 patients). Between the two treatment groups, there were no statistically significant differences in the change in serum Hct, ferritin, iron, or total iron binding capacity (P > 0.05). In the iron sucrose group, the increase in Hct levels was statistically significant at weeks 4, 8, and 10. In the ferric chloride group, the increase in Hct levels was statistically significant at week 8. No obvious major side effects were observed in both groups. Conclusion: In the study subjects, parenteral iron sucrose was as effective and safe as ferric chloride for treating anemia in HD patients. Background: The aim of this study was to evaluate maternal and perinatal outcomes in preeclampsia (PE), according to the value of albumin. Materials and Methods: Preeclamptic women were retrospectively divided into mild hypoproteinemia (MHP, n = 220) and severe hypoproteinemia (SHP, n = 79) PE according to the value of albumin. The maternal and perinatal outcomes were evaluated in both groups. Results: Two hundred and ninety-nine single pregnancies complicated by PE were included in this study. Gestational age at delivery was earlier in SHP than MHP (P < 0.01). Severe hypertension, abnormal liver function, abnormal renal function, ascites, and abruption occurred more frequently in SHP than in MHP (P< 0.01, 0.03, <0.01, 0.01, and 0.04, respectively). Women in SHP had a higher rate of cesarean section than those in MHP (P = 0.04). Fetal growth restriction infants were more frequent in SHP than in MHP (P < 0.01). The occupancy rate of the Neonatal Intensive Care Unit was higher in SHP than in MHP (P < 0.01). Conclusion: SHP PE is associated with a higher risk of adverse pregnancy outcome than MHP PE, deserving closer surveillance during pregnancy. Background: Muscle relaxant agents usually use to facilitate tracheal intubation; however, sometimes limitations exist. Magnesium (Mg) sulfate is a candidate for muscle relaxant substitute. This study was designed to determine the effect of Mg sulfate accompanied with propofol and fentanyl in patients undergoing ophthalmic surgery. Materials and Methods: In a double-blind randomized protocol and before tracheal intubation, Mg sulfate 40, 45, or 50 mg/kg in 100 ml of saline (Groups 1–3, respectively) or saline alone (Group 4) were administrated intravenously in 100 patients (n = 25 in each group) with the American Society of Anesthesiologist (ASA) physical Status I, II, or III. The patients' intubation condition in all subjects were determined and described. Results: The patients' demographic data including age, ASA, systolic and diastolic blood pressures, intraocular pressure, and body mass index were not significantly different between the groups. A better mask ventilation feasibility in Mg sulfate 45 group (Group 2) was observed when compared with Mg sulfate 50 (Group 3) (P = 0.022) and saline group (Group 4) (P = 0.021). 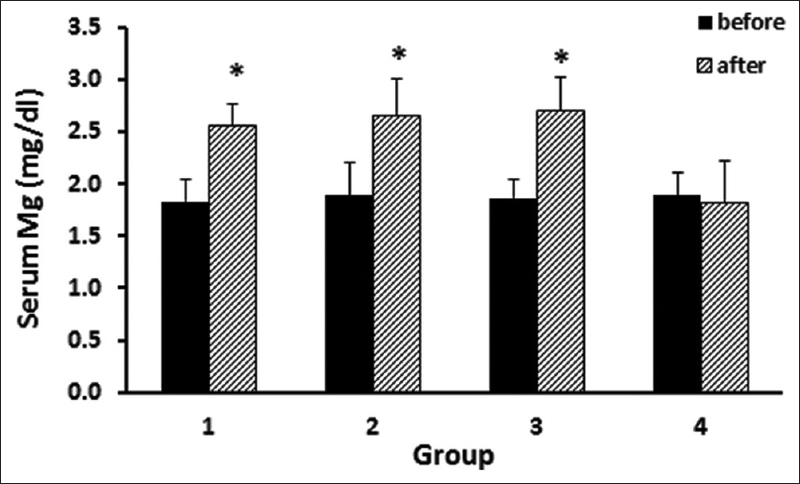 In addition, the vocal cord movement and muscle relaxant requirement in saline group were significantly different from others groups (P < 0.05). The laryngoscopic time in saline group was greater than other groups significantly (P < 0.0001). Conclusion: Intravenous administration of Mg sulfate accompanied with propofol and fentanyl facilitates the tracheal intubation without neuromuscular blocking agents. To avoid Mg level increasing in plasma; however, the low dose of Mg sulfate is suggested. Background: The second leading cause of cancer deaths in women is breast cancer. Germline mutations in susceptibility breast cancer gene BRCA1 increase the lifetime risk of breast cancer. Eighty-one large genomic rearrangements (LGRs) have been reported up to date in BRCA1 gene, and evaluation of these rearrangements helps with precise risk assessment in high-risk individuals. In this study, we have investigated LGRs in BRCA1 among Iranian high-risk breast cancer families. Materials and Methods: Seventy patients with breast cancer who were identified negative for point mutations or small deletions/insertions of BRCA1 gene were selected. Deletions and duplications of BRCA1 gene were evaluated using multiplex ligation-dependent probe amplification (MLPA). Results: Two deletions, deletion of exons 1A/1B-2 and exon 24, were detected in two patients with breast cancer. The former alteration was found in a woman with a strong family history of breast cancer while the latter one was detected in a woman with early onset of breast cancer. Conclusion: Although our data confirm that LGRs in BRCA1 comprise a relatively small proportion of mutations in hereditary breast cancer in the Iranian population, MLPA analysis might be considered for screening of LGRs in high-risk individuals. It is worth to note that our results are consistent with previous studies in various Asian and European countries.